What is Valuation Modeling in Excel? Valuation modeling in Excel may refer to several different types of analysis, including discounted cash flow (DCF)DCF Model Training Free GuideA DCF model is a specific type of financial model used to value a business. DCF stands for Discounted Cash Flow, so the model is simply a forecast of a company’s unlevered free cash flow discounted back to today’s value. This free DCF model training guide will teach you the basics, step by step with examples and images, comparable trading multiples, precedent transactionsPrecedent Transaction AnalysisPrecedent transaction analysis is a method of company valuation where past M&A transactions are used to value a comparable business today. Commonly referred to as “precedents”, this method of valuation is used to value an entire business as part of a merger/acquisition commonly prepared by analysts, and ratios such as vertical and horizontal analysis. The above types of analysis may be built from scratch in Excel or may use an existing template/model. This type of work is commonly performed by a wide range of finance professionals. Why perform valuation modeling in Excel? There are many reasons to perform valuation modeling in Excel, and professionals across a wide range of industries spend a significant amount of time doing this type of work. How to perform valuation modeling in Excel? As noted above, there are three main methods (and many more) for valuing a company. Discounted cash flow or DCF analysis is the most detailed method and often the most relied upon approach. Below is a description of how to perform each type of modeling. In this approach, an analyst or finance professional takes 3-5 years of historical financial information for a business and puts it into Excel. Next, they link the three financial statementsHow the 3 Financial Statements are LinkedHow are the 3 financial statements linked together? 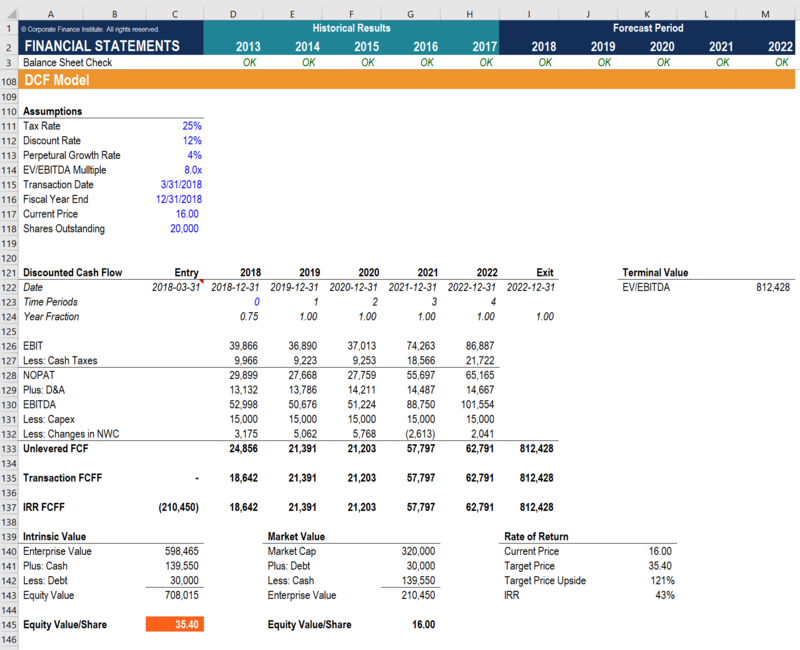 We explain how to link the 3 financial statements together for financial modeling and valuation in Excel. Connections of net income & retained earnings, PP&E, depreciation and amortization, capital expenditures, working capital, financing activities, and cash balance together so they are dynamically connected. Following that, assumptions are made about how the business will perform in the future, and those assumptions are used in Excel formulas to create a forecast for the future (typically about five years into the future). Finally, they calculate a terminal valueTerminal Value​The terminal value is used in valuing a company. The terminal value exists beyond the forecast period and assumes a going concern for the company. for the business and discount the forecast period and the terminal value back to the present using the company’s weighted average cost of capitalWACCWACC is a firm’s Weighted Average Cost of Capital and represents its blended cost of capital including equity and debt. The WACC formula is = (E/V x Re) + ((D/V x Rd) x (1-T)). This guide will provide an overview of what it is, why its used, how to calculate it, and also provides a downloadable WACC calculator (WACC). For a more detailed explanation, read this step-by-step guide to DCF modelingDCF Model Training Free GuideA DCF model is a specific type of financial model used to value a business. DCF stands for Discounted Cash Flow, so the model is simply a forecast of a company’s unlevered free cash flow discounted back to today’s value. This free DCF model training guide will teach you the basics, step by step with examples and images. This approach to valuation modeling in Excel is very different than a DCF model. In the Excel method, instead of determining a company’s intrinsic value (as above), an analyst will look at the valuations of other publicly traded companies and compare them to the businesses they wish to value. Common examples of valuation multiples include EV/Revenue, EV/EBITDAEV/EBITDAEV/EBITDA is used in valuation to compare the value of similar businesses by evaluating their Enterprise Value (EV) to EBITDA multiple relative to an average. In this guide, we will break down the EV/EBTIDA multiple into its various components, and walk you through how to calculate it step by step, EV/EBIT, Price/EarningsPrice Earnings RatioThe Price Earnings Ratio (P/E Ratio) is the relationship between a company’s stock price and earnings per share. It gives investors a better sense of the value of a company. The P/E shows the expectations of the market and is the price you must pay per unit of current (or future) earnings, and Price/BookValuationFree valuation guides to learn the most important concepts at your own pace. These articles will teach you business valuation best practices and how to value a company using comparable company analysis, discounted cash flow (DCF) modeling, and precedent transactions, as used in investment banking, equity research,. For a more detailed explanation, read this guide to comparable company analysisComparable Company AnalysisHow to perform Comparable Company Analysis. This guide shows you step-by-step how to build comparable company analysis ("Comps"), includes a free template and many examples. Comps is a relative valuation methodology that looks at ratios of similar public companies and uses them to derive the value of another business. With this third approach to valuation modeling in Excel, an analyst will look at the prices paid for mergers and acquisitions (M&A) of similar businesses that took place in the past. This is also a relative form of valuation, but unlike comparable trading multiples, these transactions include takeover premiums (the value of control) and are based in the past (can quickly become out of date). For a more detailed explanation, read this guide to precedent transactionsPrecedent Transaction AnalysisPrecedent transaction analysis is a method of company valuation where past M&A transactions are used to value a comparable business today. Commonly referred to as “precedents”, this method of valuation is used to value an entire business as part of a merger/acquisition commonly prepared by analysts. To perform this type of analysis, finance professionals require many different skills that can often take years of education and experience to master. CFI’s Financial Analyst CertificationFMVA™ CertificationThe Financial Modeling & Valueation Analyst (FMVA)™ accreditation is a global standard for financial analysts that covers finance, accounting, financial modeling, valuation, budgeting, forecasting, presentations, and strategy. covers all of these in one intensive online program, while other designations may not cover all skill areas. There are many jobs and career paths that require the skills of being able to value a company, a business unit, or an investment opportunity in Excel. 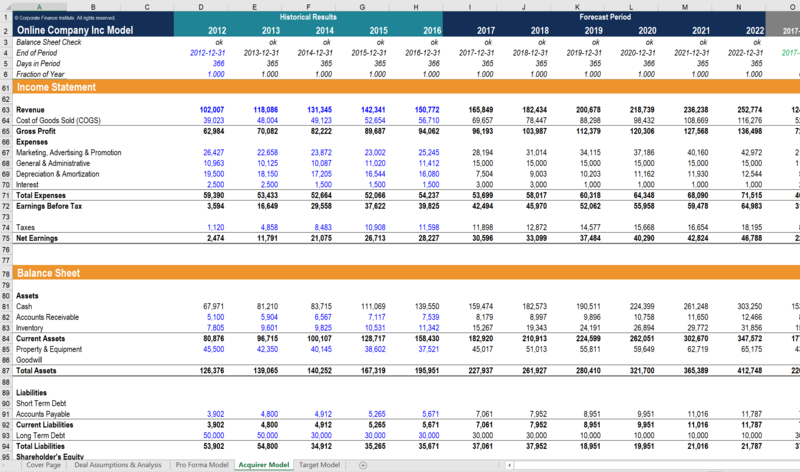 Why use Excel for valuation modeling? The flexibility of Excel is both a blessing and a curse. While larger organizations may attempt to use software to manage their financial modelingWhat is Financial ModelingFinancial modeling is performed in Excel to forecast a company's financial performance. Overview of what is financial modeling, how & why to build a model. A 3 statement model links income statement, balance sheet, and cash flow statement. More advanced types of financial models are built for valuation, plannnig, and, the reality is they often end up reverting back to Excel. On this flip side, however, this flexibility means models are prone to errors, inaccurate calculations, and poor practices. Analysts and other finance professionals must ensure that they possess strong Excel modeling skills and a thorough understanding of industry-leading best practices. Thank you for reading this guide and overview to valuation modeling in Excel. Hopefully, by now, you have a solid understanding of what it is, why it’s used, how it’s performed, and the skills required to carry it out. Excel Modeling Best PracticesExcel Modeling Best PracticesThe following excel modeling best practices allow the user to provide the cleanest and most user-friendly modeling experience. Microsoft Excel is an extremely robust tool. Learning to become an Excel power user is almost mandatory for those in the fields of investment banking, corporate finance, and private equity. Become a certified Financial Modeling and Valuation Analyst (FMVA)®FMVA™ CertificationThe Financial Modeling & Valueation Analyst (FMVA)™ accreditation is a global standard for financial analysts that covers finance, accounting, financial modeling, valuation, budgeting, forecasting, presentations, and strategy. by completing CFI’s online financial modeling classes!